Minimalism and financial independence go hand in hand. In order to reach financial independence, you are more than likely going to need to develop some minimalist habits. I’m not saying that you have to live in a 500 square foot tiny home with all white walls and no furniture … but you are going to need to make some sacrifices. Since we have been together, my wife and I have always led mostly frugal lives. We don’t usually overspend (except on our big house) and don’t hold any credit card debt. Overall, we save and invest as much as we can … and live below our means. But that doesn’t necessarily mean we are doing everything we can to reach financial independence. Which is where minimalism comes in. Over the past year (or so), we have slowly been adopting more minimalist habits in our daily lives. And in that time, we have uncovered many different areas of our lives that we can cut back on … despite already living below our means. Speaking from our own experience, we have realized there are plenty of areas we can cut back on in our lives. We have been going room to room in our home and adding items to our ever growing donation pile. Clothes seem to be the majority of our minimalist efforts to this point. But we have recently started finding things in our kitchen we don’t use. And our garage has tons of things that we are purging from our lives. We have also realized that saving money is one of the benefits of minimalism … but there are plenty of other benefits that don’t have a price tag. For example, I recently deleted a bunch of apps on my phone. These were all free apps and didn’t cost me anything … except for my time. I’ve only kept the apps I use on a daily basis and it has reduced my daily stress level believe it or not. Another thing we are in the process of cutting back on is our financial accounts. We had 4 checking accounts! So we agreed to close 2 of the 4 to make our finances simpler. So when you are thinking about adding minimalism to your life … don’t just focus on things that cost money. There are tons of opportunities to cut back in all areas of your life. Today … I wanted to give a recap of our latest minimalist project – my cubicle at work. As it stands now, I have purged 39 items from my cube at work over the past week. Some of them are a bit silly like an old paper airplane one of my ex co-workers and I would always toss back and forth to relive some stress. Other things actually had some value at one point in my career – like a couple programming textbooks. Overtime, I expect this list to continue to grow and evolve. And I still haven’t even cleaned out one of my big cabinets in my cubicle. I’ve been putting that one off! #7 – 1 Christmas card hanging up from ??? #15 – 1 2-pound container of oatmeal that expired back in 2013 … it was almost 6 years past the expiration date … does oatmeal actually go bad? #18 – 1 unopened 32 oz. box of chicken stock … another item I am taking home to cook with … but why do I have so many things to cook with at work? without any kitchen? #22 – 1 indoor extension cord … why do I have this at work? #29 – 1/2 roll of packing tape … why is this at work? #32 – 1 auto first aid kit … maybe I should put this in my car? #39 – 1 paper airplane … gotta have a little fun at work … am I right? Note – I actually purged way more than 39 physical items from my cube at work. I probably got rid of close to 100 plastic grocery bags. But as far as counting the number of items I purged, I only counted each unique item as 1. Where Did All These Items Go? One of my biggest hang-ups with minimalism and getting rid of things is the – how? For one thing … I have a hard time letting go of something I may have paid good hard earned money for. Unless the item is damaged or broken … the old me would want to hold onto it because there was still value. The new minimalist me has gotten past those hang-ups. But that brings up a new issue. What do we do with the items we are letting go of? I’m not a big fan of throwing unused (and unwanted by anyone) items in the trash. Of course, some things can be recycled (I guess) like my old programming text books. Some of the other items are going home with me to be used there like the cooking items, post-it notes, tape, etc. The textbooks got recycled. I just couldn’t find anyone who wanted to buy these things. I donated some of the other office items to our community supply cabinet at work. A lot of the paper goods, plastic containers, etc. got recycled too. The old coffee maker, backpack, and hoodies went to Goodwill. And the expired applesauce and oatmeal went in the trash. 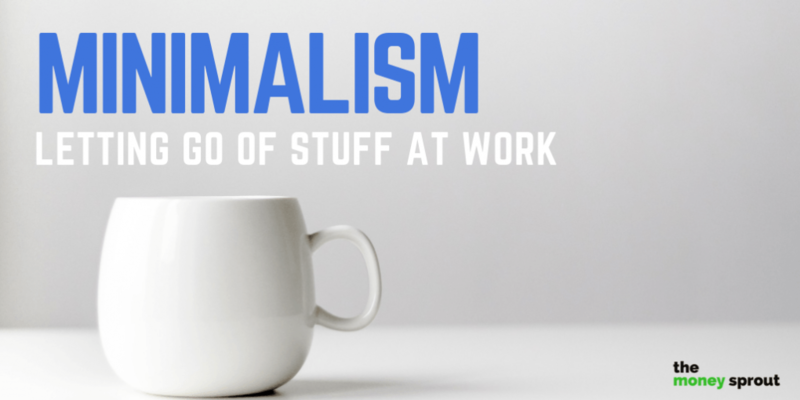 Living in a consumerist society, adopting minimalism can be a difficult thing. That is why we are taking the slow approach to getting rid of our stuff. And we are not getting rid of everything … just the items that don’t hold value for us anymore. We are looking to live simpler lives by owning less. But we still want to own some things that hold value in our lives. Owning less will ultimately help us save money. We just won’t have the need to spend as much. And we will have more time in our day as a result of having less stuff to distract us. We truly believe that minimalism will help us hit our financial independence goals much faster. Have you adopted minimalist habits in your pursuit of financial independence?